(Amesbury MA) Way too much Alli for Georgetown. 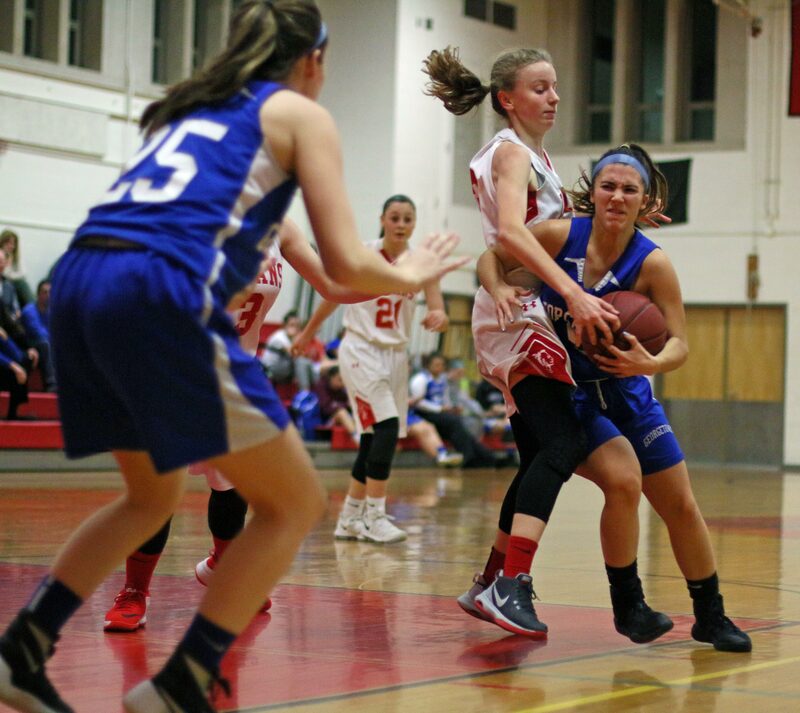 “She’s probably the best I’ve seen in the league this year,” said G’Town coach Hilary Glynn afterwards. 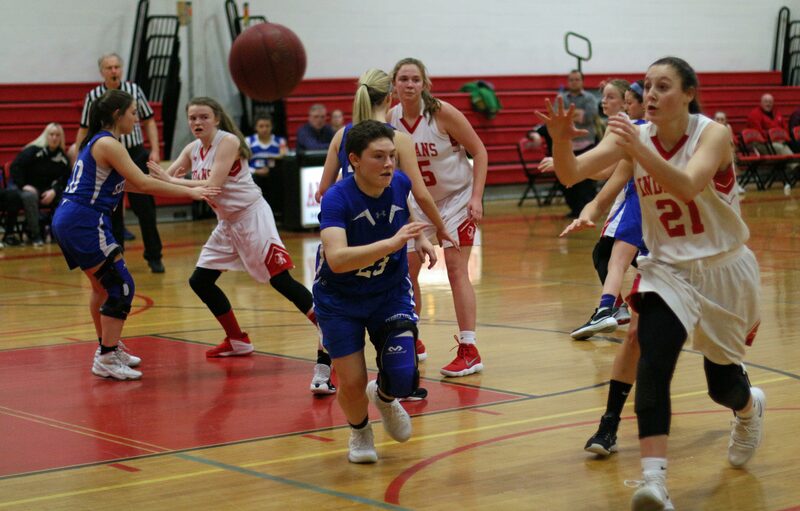 Sophomore Alli Napoli had the whole basketball package working as she led Amesbury to a 50-41 win over the Royals on Thursday night in Cape Ann League play. 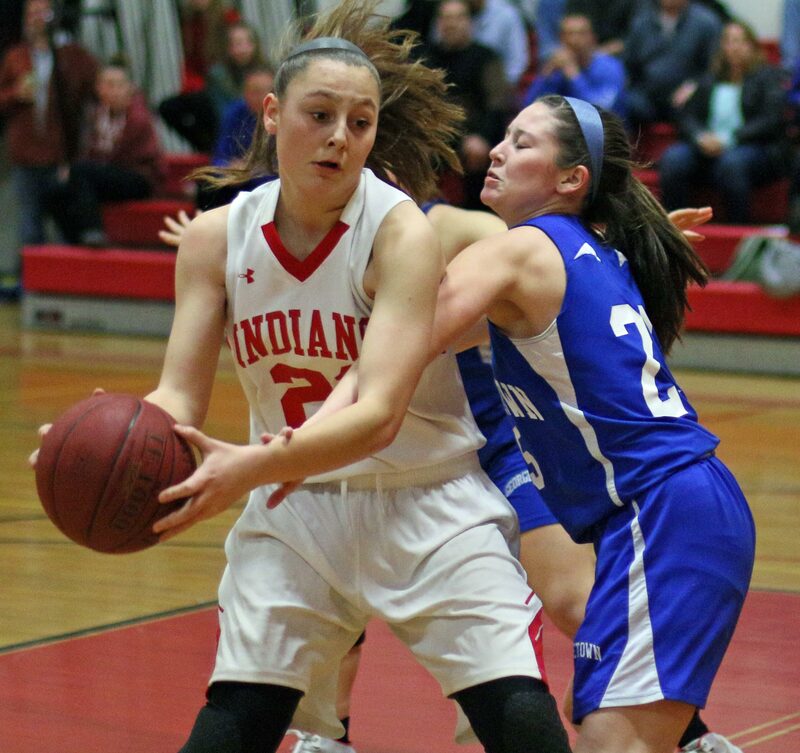 Alli had thirty points but it was the things beyond the points that led the Indians to their tournament-qualifying 10th win. The “other things” that I noticed were; rebounds, blocked shots, assists, steals, and bringing the ball up the court. That lack of quit showed itself in the fourth quarter. The Indians (10-4) had a comfortable, 46-29, lead one minute into the final quarter. Good time to pack it in if you’re Georgetown, but they didn’t. Amesbury went very cold (credit the G’Town defense) and turned the ball over nine times during the next 6+ minutes. 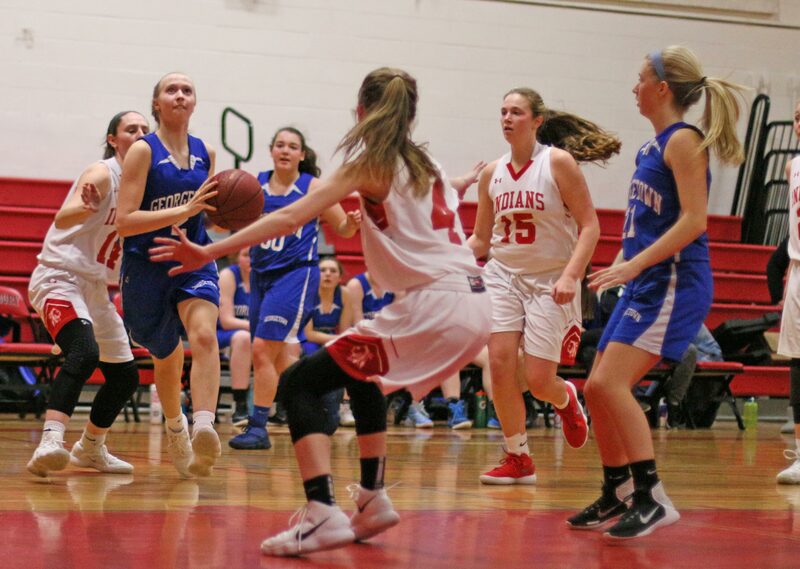 The visitors put a run of twelve unanswered points together including a layup by Lilly Dionne (assisted by Haylee Zadina) that had the Royals trailing by only five, 46-41, with forty-two seconds left. Georgetown (2-12) had another possession with that five-point deficit and missed four shots in that possession, including three 3’s. Make one of those and final seconds could have been verrrry interesting. Things turned Amesbury’s way, thereafter. Amesbury’s Kaicey Zimmer was fouled. She missed the front end of a one-and-one with forty seconds left BUT there was a lane violation on the Royals. Given another chance, Kaicey made the free throw but missed the second. 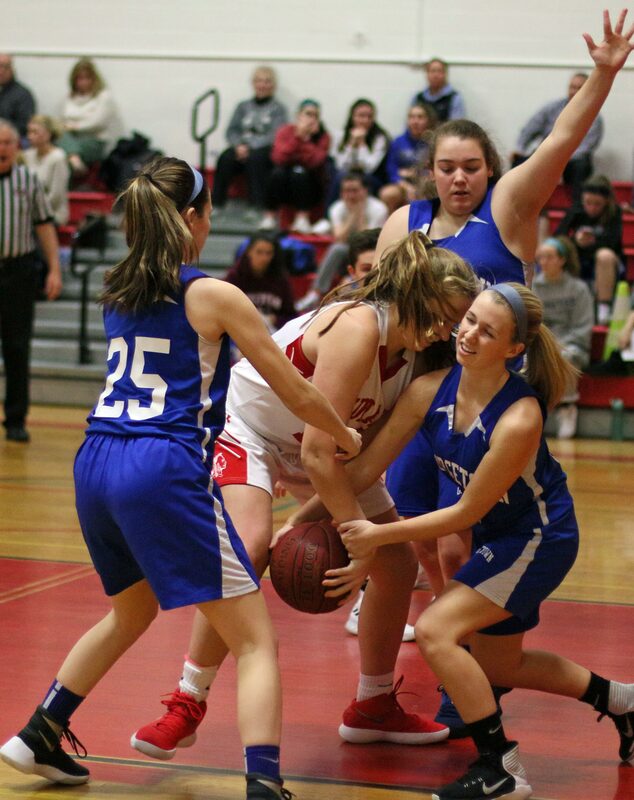 To the surprise of no one, Alli Napoli grabbed the rebound for Amesbury and was fouled. That’s twice Georgetown could have had the ball but didn’t get it. 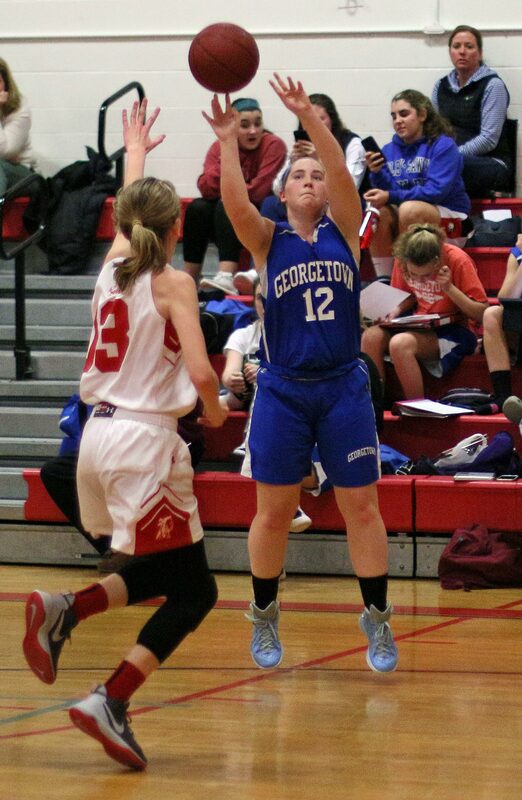 Alli made both free throws to push the AHS advantage to eight and the Royals were done for. 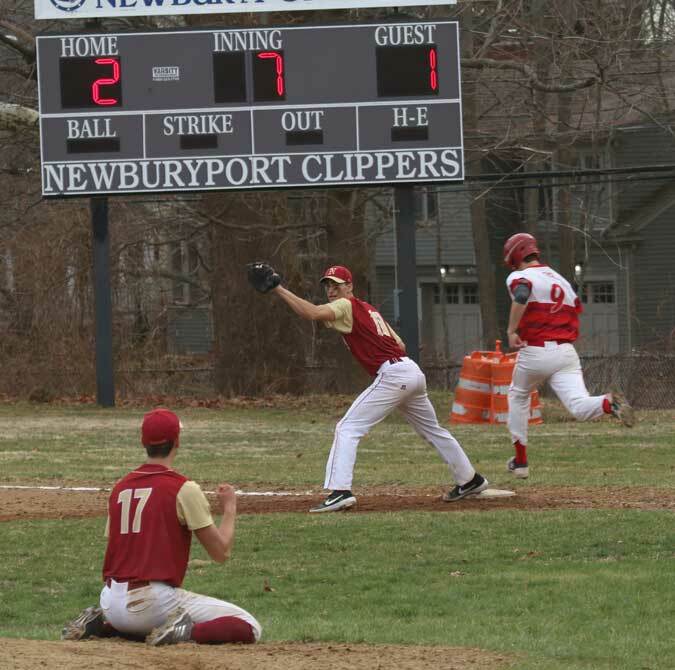 Amesbury has now defeated Georgetown ten straight times. 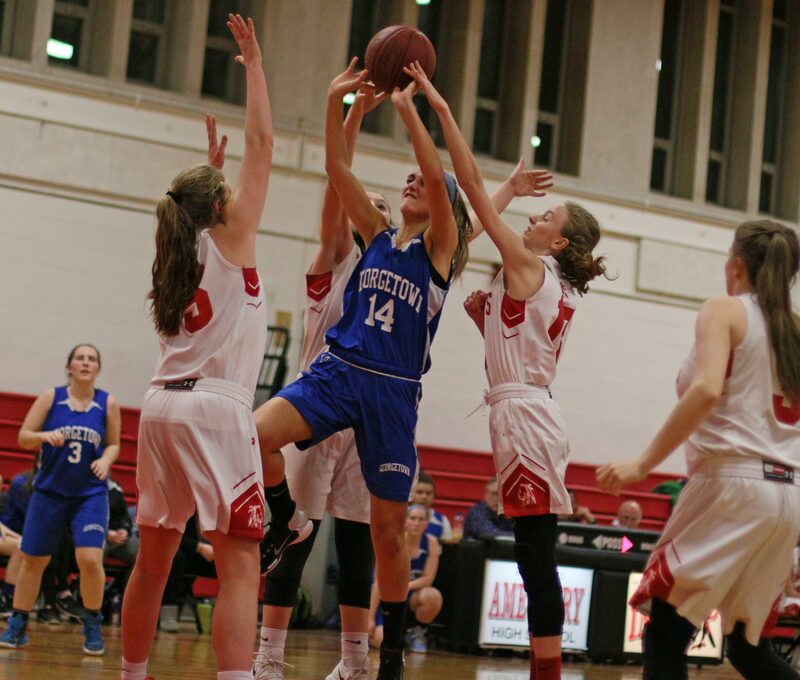 One play that was very effective for Amesbury was having Alli on one side (drawing multiple defenders) and having her throw a cross-court pass to the other side to an open teammate. Mary Bullis (8 points) ended up with good 3-point looks out of that set. 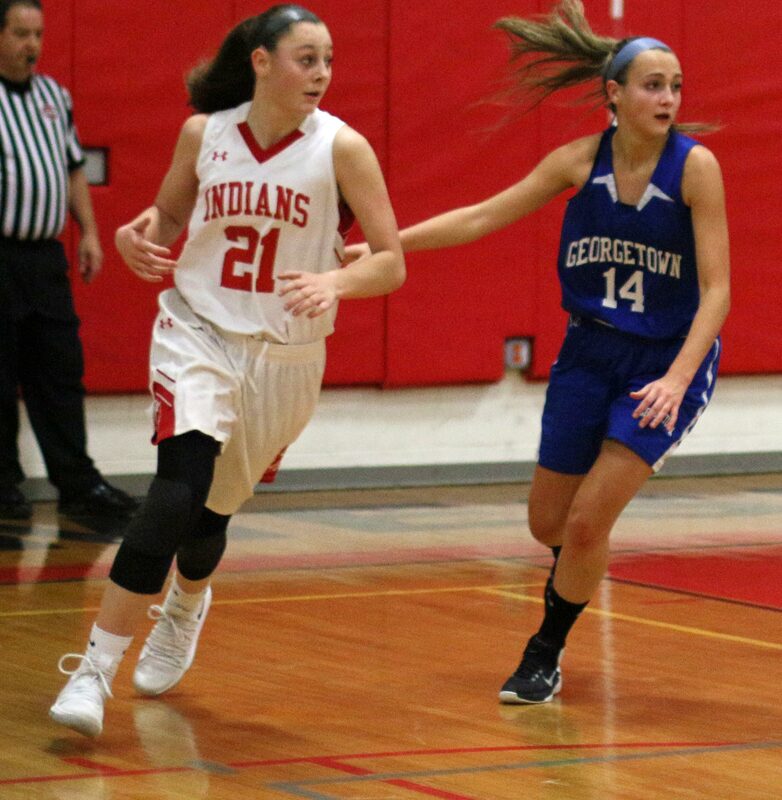 Autumn Dionne (11 points) led the G’Town scorers. Autumn wears a serious knee brace and has torn her ACL twice. She fell once in the second half and required medical attention but did return later in the game. The Royals weren’t shy about putting up 3-pointers. Might have something to do with the fact that Coach Glynn holds the Framingham State career 3-point record. 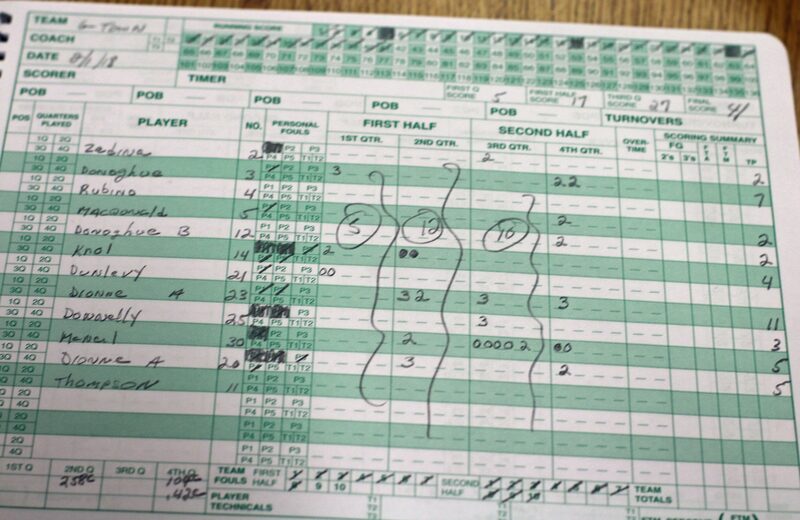 I saw Amesbury lose a tough game to Hamilton-Wenham when Flannery O’Connor was playing. 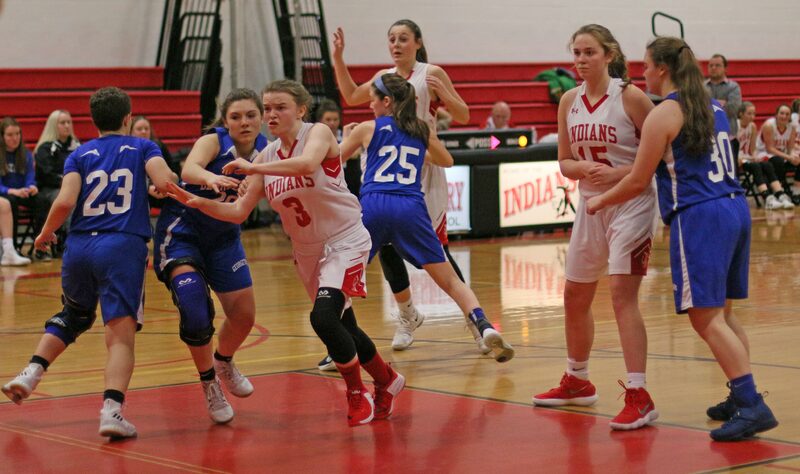 In that one, the Indians were impatient on both ends of the court rushing shots and getting out of position on defense. Not tonight. The offense was organized and the defense (man-to-man) was stable. 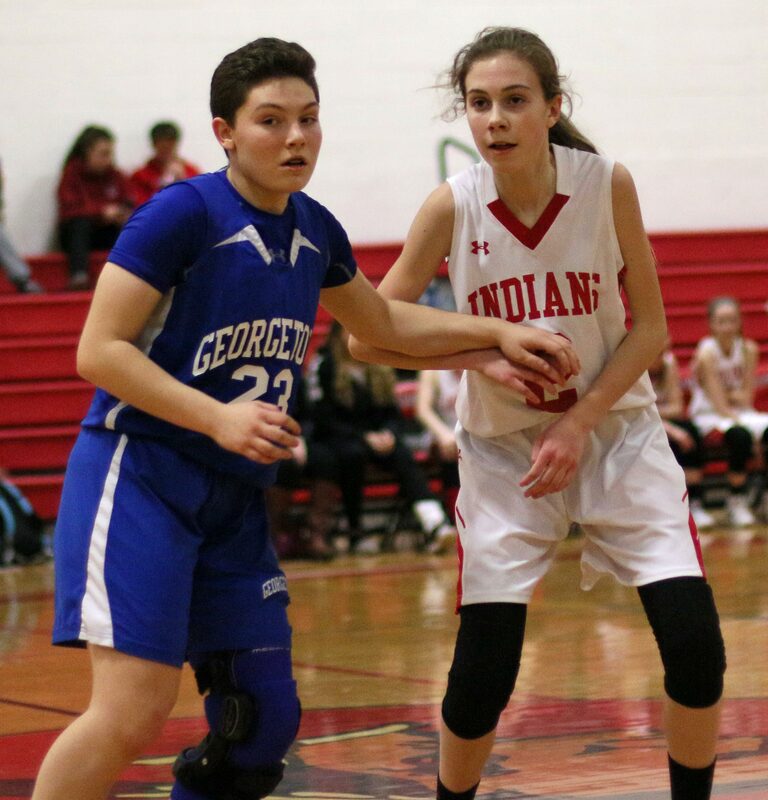 Amesbury ended up with seventeen turnovers, including nine in the final quarter when Georgetown made their run. Georgetown had fifteen, but only one in the last quarter. The Indians built up a 15-point lead in the second quarter with ten unanswered points. 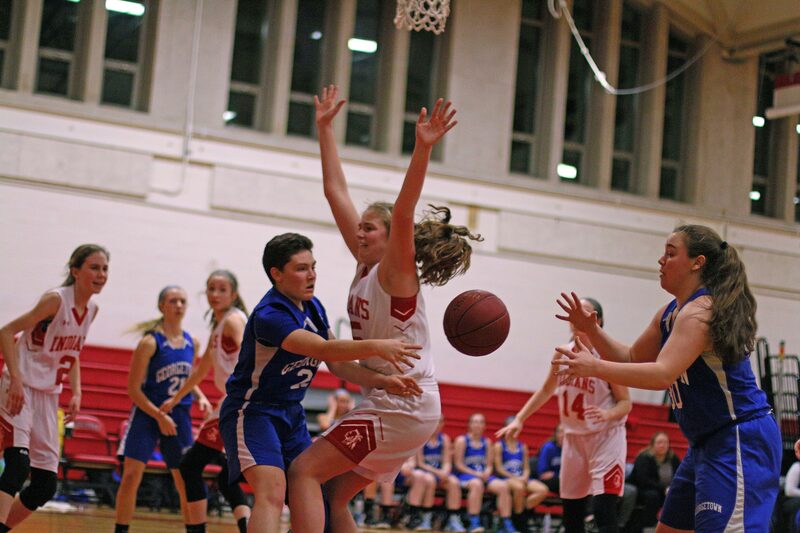 Mary Bullis had two 3’s while Alli turned a steal into a basket and also made two free throws. Nine players scored for the Royals. Six different players (Maeve McNeill, Brenna Donoghue, Caitlin Donoghue, Grace MacDonald, Autumn Dionne, and Lilly Dionne) were part of Georgetown’s twelve-point streak in the final quarter. Alli ended up with three 3’s. She had eleven points in the second quarter and twelve in the third quarter. Her rebound in the final minute sealed this one for the home team. I bring a camera to games as well as a mopod to stabilize it. Tonight, one of the referees knew enough about my mopod to use it to loosen a basketball that was stuck against the rim. Quiet crowd on hand. 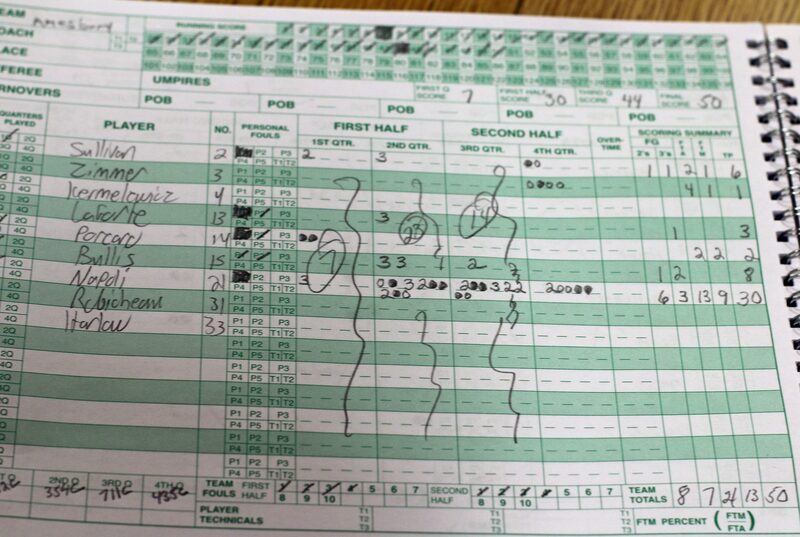 I noticed Georgetown JV’s working on homework.